MuseScore source code is hosted on GitHub. 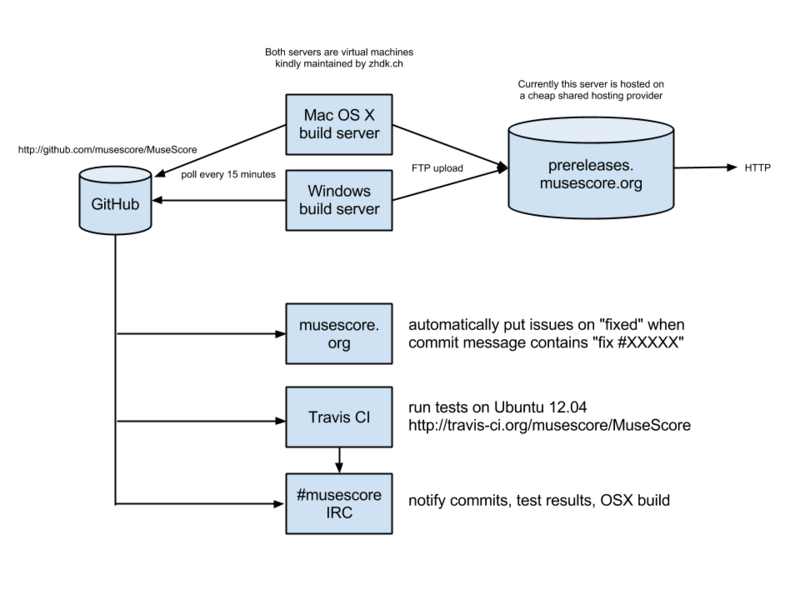 The MuseScore binaries for stable and nightly releases are hosted by OSUOSL. We have two shares. We used to call them "nightly builds" but they aren't so much "nightly" anymore. AppVeyor is used to create development builds for Windows for the active branches. The packages for Windows are uploaded via FTP on https://ftp.osuosl.org/pub/musescore-nightlies/. Only the last 40 nightlies are kept there. Note that AppVeyor also hosts the Windows packages, including for PR. This is very useful if a developer wants to create a test package for an unmerged PR. The build process notifies the #musescore IRC channel when a new build is available. For macOS and Linux, nightlies are built by Travis-CI. See below. For every code pushed, GitHub sends a notification to Travis-CI.org, a free hosted continuous integration service for the open source community. Travis uses the file .travis.yml at the root of the source code tree to build MuseScore, and run the unit tests located in the mtests directory. If the build or the tests fail, Travis will notify the #musescore channel on IRC, and send emails to committers. Travis also creates nightly builds for macOS and hosts them to OSUOSL. The whole build process is public self contained in the git repository. GitHub can send a POST HTTP requests to any URL. MuseScore.org uses this feature to receive notification of every new commit on the master branch of the Git repository. If the commit message starts with "fix #xxxxx", with xxxxx the issue number in the issue tracker, the issue will be marked as fixed automatically. GitHub sends a notification on the #musescore IRC channel for each new push on the Git repository. We use Travis-CI cron capabilities to run the following project periodically https://github.com/musescore/tx2s3. The process takes TS files from Transifex and upload them to S3. The Resource Manager in MuseScore connects to S3 to get the latest language updates.